Not too long ago Jatropha became a bit of a talking point among biodiesel enthusiasts and researchers. At one point some suggested that this plant has enormous potential it could be the next big money spinner for Malaysia. I remember reading one of the local dailies over breakfast that Jatropha's potential for biodiesel production could at least match that of or bigger than palm oil. That is a tall order for the un-tested commodity, but who knows. Terengganu is considering such option to produce biodiesel - as reported by Bernama. I just hope that a full assessment would be carried out prior to granting of funds to entrepreneurs. You don't want another National Feedlot Centre blunder, do you? Wonder Plant? 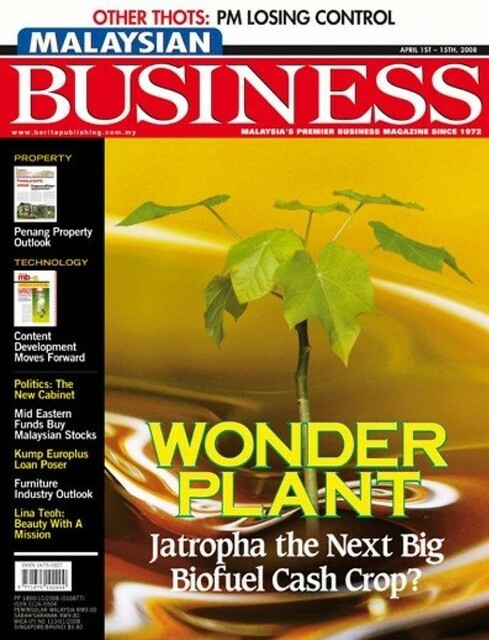 Cover page of the Malaysian Business, April 2008. KEMAMAN, Nov 10 (Bernama) -- The Terengganu state government will consider the application by the Forest Research Institute Malaysia (FRIM) to plant jatropha on a large-scale to produce biodiesel in the state. Menteri Besar Datuk Seri Ahmad Said stressed however, that the state government would scrutinise any high-impact project before approving it for the benefit of the people and the state. "Many aspects need to be studied, such as the cost, returns, implementation approach and whether the investment is worth it," he told reporters when asked to comment on FRIM's readiness to carry out the project in Terengganu. It was reported in the media yesterday that FRIM would submit an application to the state government to request for land along the coast for the project. Besides maximising Terengganu's coastal areas which had been categorised as unfeasible for commercial agriculture because of the extreme heat, the project was seen to potentially generate income for the local residents. Credit: Cover page image of the Malaysian Business, April 2008 can be found at Dunia Tiger's blog.